Triple layers of chocolate brown, pink and Fleur De Leis in satin! This is a popular themed ribbon that all the girls will love. The base is a light pink grosgrain ribbon, then a chocolate brown grosgrain ribbon in the middle. 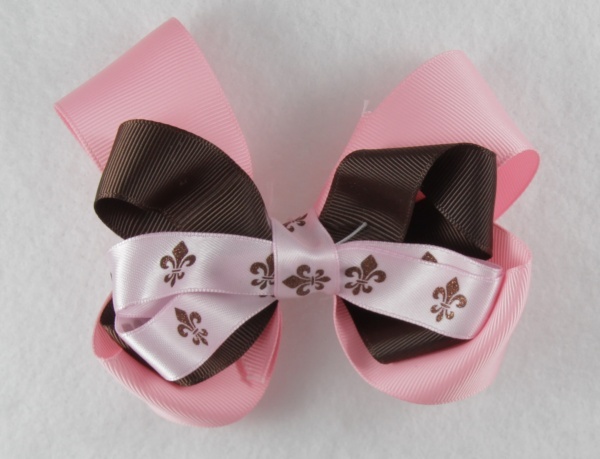 The top bow and the center of the bow has the light pink satin ribbon with chocolate brown Fleur De Leis on it. What a great lethal combination, you must have.